by Ms. Charulata Mani. The article has been well written except for some minor errors. The 3 kritis attributed to Saint Tyagaraja are not his own compositions. They are compositions of KV.Srinivasa Iyengar with Tyagaraja mudras in them. About 15-20 kritis composed by others with Tyagaraja mudras are in circulation.Unfortunately, these kritis are printed in some books and compilations of Tyagaraja kritis. These are spurious kritis or Prakshipta kritis of Tyagaraja. Kindly check all info. before the article is sent for publication in news papers like the Hindu, which is widely read. I will send an article prepared by me on the "Prakshipta Kritis of Tyagaraja" in my next mail. It appears that you have not read the article thoroughly. I have worded it as "is attributed to Thyagaraja" and NOT stated that IS composed by Thyagaraja. In my wide experience with several illustrious gurus I very well know about "Needu.." and "Natajana" not being confirmed as Thyagaraja's compositions. You may refer to my booklet (see PDF above) published along with my DVD Vol 5 even back in 2007 in which I have explicitly stated that the authorship is in question. I have also NOT mentioned anywhere in the article that "Natajana" is composed by Thyagaraja. This is with reference to Charulatha Mani’s fortnightly article ‘A Raga’s Journey’ that has raga Simhendramadhyamam in today’s issue of Metroplus supplement. 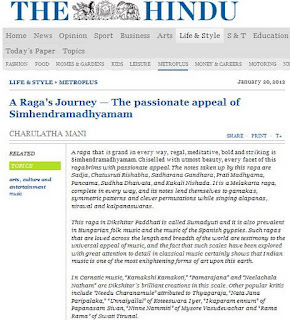 Why this time Charulatha did not get a rhyming title for her article like ‘Scintillating Simhendramadhyamam’ or ‘Soothing Simhendramadhyamam’, I wonder. The music composer of the M K Thyagaraja Bhagavathar film Ambikapathy(1937) is Papanasam Sivan and not G Ramanathan. G Ramanathan is the composer of only the Sivaji Ganesan starrer Ambikhapathy (1957). G Ramanathan did not even compose for films during the 1930s. The alliterative (not rhyming) titles were created by the MetroPlus editor, not by me, so I cannot comment on the change. The reference to G.Ramanathan is indeed erroneous. Thank you for pointing it out. A correction will be included in the next instalment. I convey my hearty wishes to Ms Charulathaman on her birthday today. May God bless her with good health, lasting joy and everlasting service to the cause of music ! 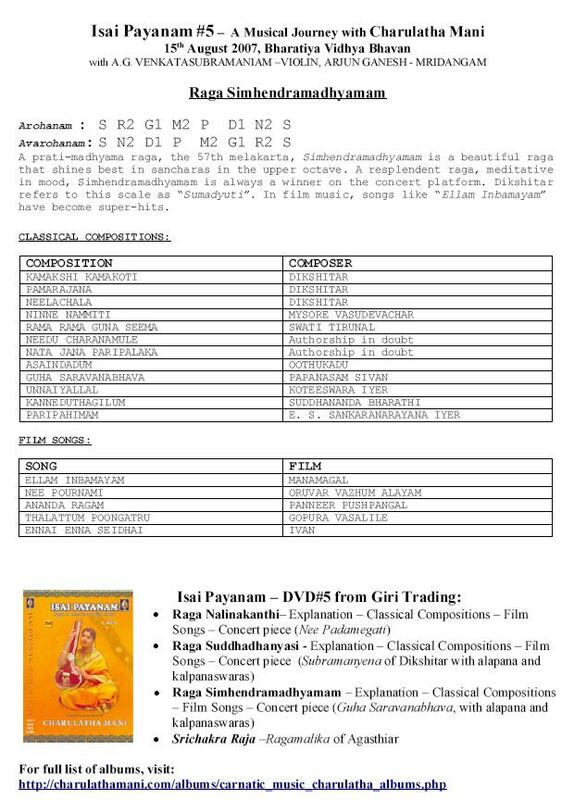 The other Simhendramadhyamam reference that always comes to mind first for me is the Ilayaraja fusion instrumental album "How to name it"..The first song, called "How to name it" I believe is also Simhendra Madhyamam based?